De Sautys Bridge Experiment Setup & Schearing Bridge Experiment Apparatus Setup is useful for measuring a very small value of Capacitance. By setting the null point, we can evaluate the unknown capacitance. To set this point, a null detector with amplifier circuit is implemented on trainer board. It is based on the principle of Wheatstone Bridge. A Function Generator is provided for Frequency and Amplitude variation. Null detector section includes the differential amplifier, audio amplifier, and speaker. 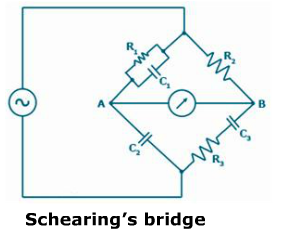 Bridges are some of the most accurate measuring devices for measuring impedance, capacitance, resistance, etc. For measuring Capacitance, using a De Sauty’s or Sobering Bridge is best. They are based on the principle of Wheatstone bridge that they have two arms. One of which has the unknown parameter. By getting the bridge balanced using the Null detector we can find this value. 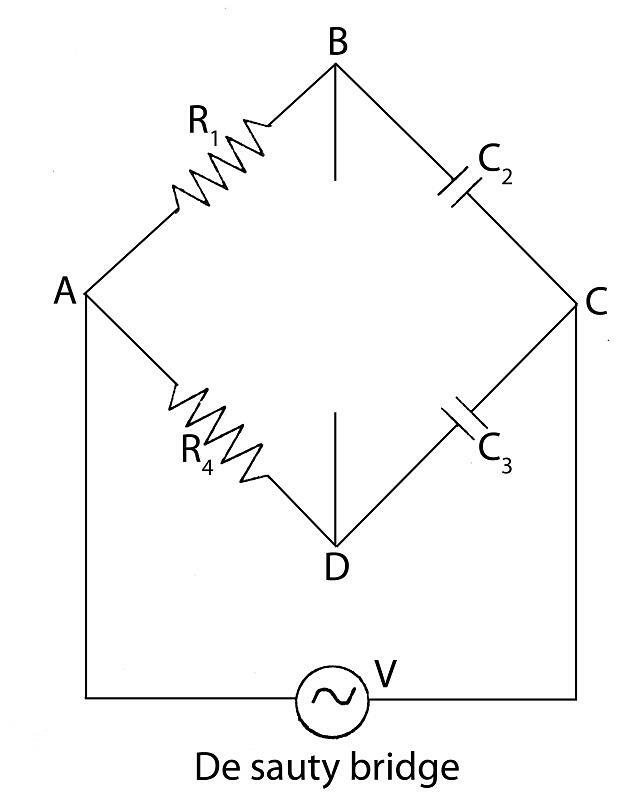 To determine the unknown capacitance using De Sauty’s Bridge method. Connect terminal 0004 (for evaluating unknown capacitance Cxt). Rotate variable resistance RI towards the anticlockwise direction. Keep toggle of Null Detector towards ‘off condition. Use Frequency Variable knob to set 2 kHz frequency on display screen. Now switch ‘On’ the power supply. Set toggle of null detector towards ‘on’ condition. Vary Amplitude Variable for enough sound of the speaker. Vary resistance Ri towards clockwise direction slowly. (Sound diminishes). Keep varying Ri until you get very low sound or null sound (null condition). Further varying Ri in same direction speaker starts sounding. Now remove the patch cord between terminal 1 & 4. Record the value of Ri in the observation table using multi-meter. Repeat the above procedure for different value of frequency and a different value of unknown capacitors. (i.e. Cot and Cx3). Tabulate all the retrieved data in the observation table below. 1. For unknown Capacitance Cx1 on frequency f1; Cx1= R2 x C2/R1. Similarly, calculate Capacitance Cx1 on frequency f2 and f3 and take the mean value. 2. For unknown Capacitance Cx2 on frequency f1; Cx2= R2 x C2/R1. Similarly, calculate Capacitance Cx2 on frequency f2 and f3 and take the mean value. 3. For unknown Capacitance Cx3 on frequency f1; Cx3= R2 x C2/R1. Similarly, calculate Capacitance Cx3 on frequency f2 and f3 and take the mean value. Que.1: What are the limitation of this bridge? Que.2: Can Dissipation factor be measured by this bridge?